Are you tired of fighting the crowds for the dregs of kid’s Halloween costumes? Frustrated with the quality of the costumes available? 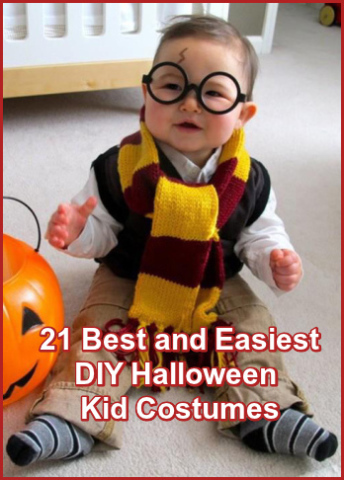 Here are 21 quick, cheap and easy options for costumes that you can make at home. 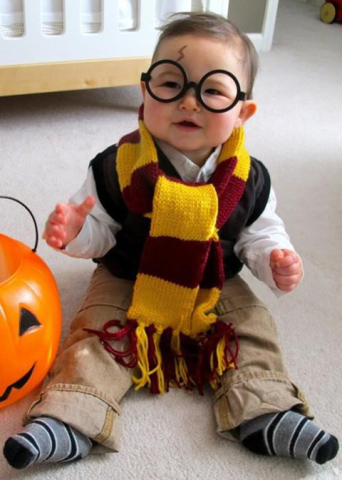 Your kids will look adorable, and you will save lots of time, money and hassle by making the costumes at home. 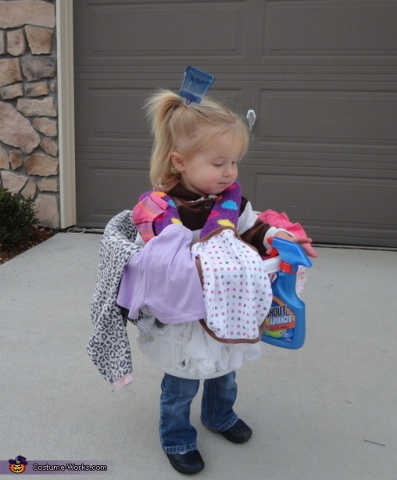 Make a quick run to the thrift store and the Dollar Store for odds and ends, and you will be set to be the most creative parent in the neighborhood. 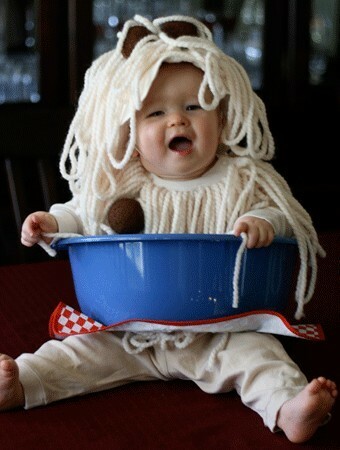 Create a fun and cute costume using just a hooded sweatshirt, sweatpants, thick cream colored yarn like this, a plastic bin from the dollar store, some Styrofoam balls like these, spray paint and hot glue. Cover the sweatpants and sweatshirt with white or cream colored yarn using the hot glue. Spray paint syrofoam balls meatball-color and add them to the mix. 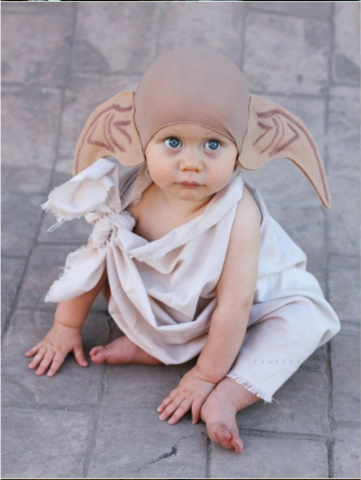 The costume will also keep a little one warm on a cool Halloween night. 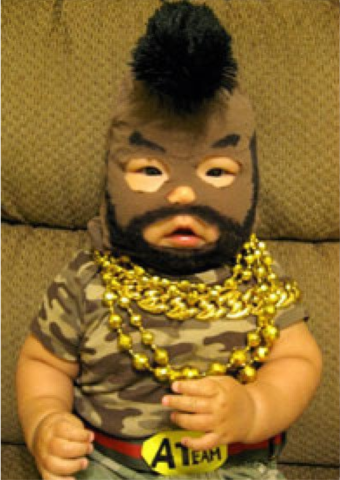 A brown ski mask like this one with fake mustache, beard and Mohawk glued on make Mr. T’s face. Dress in a camoflage T shirt and pants, gold mardi-gras beads, and a belt with a hand made A Team belt buckle. Got twins? 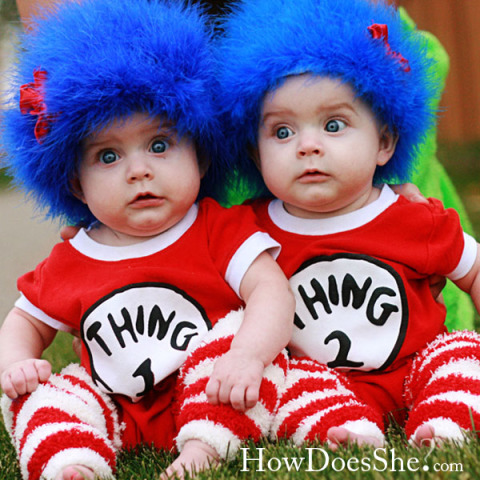 Create easy Dr. Seuss Thing One and Thing Two costumes from red onesies. Use fabric paint to make the white circles and the lettering. Find baby caps and hot glue blue yarn on them to make the blue hair. Too cute! This is an easy and cheap kid’s costume. Start with a white long-sleeved shirt and white tights. Use spray adhesive to attach batting fluff like this all over the shirt. If you can't find batting fluff, just open up an old pillow. It will get fluffier as you add more. Lightly spray the fluff with light pink spray paint. 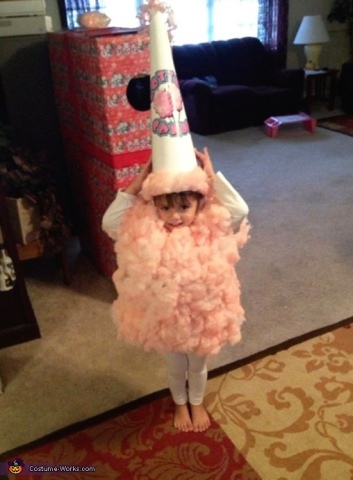 For the cone hat, simply roll a piece of white poster board into a cone shape, glue it shut and add more pink-sprayed batting around the bottom. Print out a label from a site on-line and glue it to the cone. 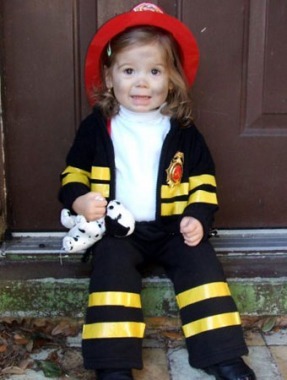 Kids want to be firefighters just like mom and dad, or their heroes on TV. 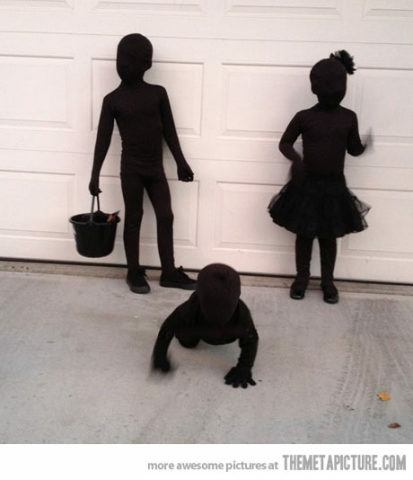 Start their costume with a black jacket and sweat pants. Put a white turtleneck underneath, and pin on red suspenders made of ribbon. Complete the bunker gear with yellow duct tape or add more realistic “reflective” stripes on the jacket and pants, and your last name cut from the yellow duct tape on the back of the jacket. Add a plastic firefighter hat (you can get one for around $5 here) and some “smoke” smudges, and you have the world’s most adorable firefighter. 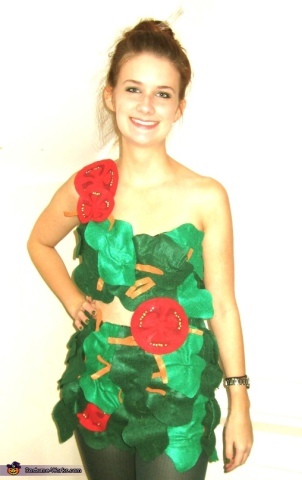 Send a kid to the school Halloween pageant as a salad. Use felt or construction paper to make lettuce leaves, spinach leaves, tomato slices, etc. Add details with marker, embroider thread, buttons, etc. Attach the salad parts to a sundress or tube-top dress with hot glue. Use plastic salad forks to accessorize. Cut a hole in the bottom of a round plastic laundry basket. You can usually pick one up for cheap at the thrift store. Attach the basket to suspenders to hold it onto the kid. Add some clothes to the basket, an empty detergent bottle and an empty stain remover bottle. 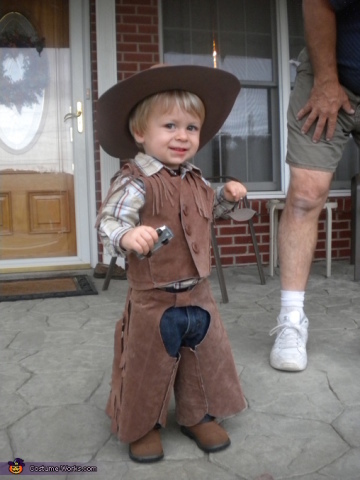 Create this cowboy costume or or similar cowboy costume you can buy online like this one without sewing a stitch. Buy a cheap leather jacket from Goodwill. Use the sleeves as the chaps. Cut the back out of the jacket to make the vest. Use the extra material to make fringe for the front of the vest. Add Velcro with the hot glue gun anywhere you need there to be a seam. You can find plastic spurs at the Dollar store or online at Amazon here. 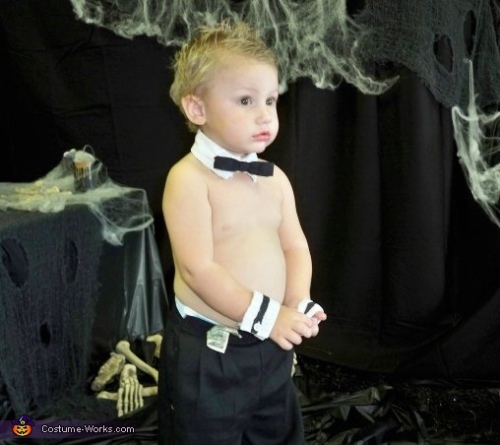 Turn your little boy into a Chippendale’s dancer. Cut the collar and cuffs off an old white dress shirt. Add a black bow tie, black dress pants and some dollar bills.Some folks may look at you cross eyed for dressing your little man as a hot dancer, but folks with a sense of humor will love it. You can make this costume with stuff you have at home. 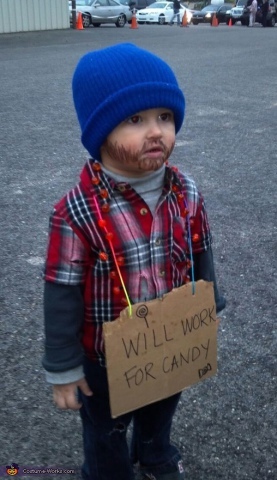 Add an eye-liner bum-beard and the cardboard sign, and your little one can go begging for candy all night long. Dress your young one up as a garden gnome. Get a baby blue long sleeved shirt, dark denim jeans, striped socks, a brown or black leather belt and some art supplies like pom poms, yarn and felt. Roll a piece of red poster board into a cone shape for the hat, and glue the edges together. Stuff the belly of the shirt with pillow batting or old clothes for that gnome-like tummy. Create a beard with felt, yarn or fake fur. Add some rouge circles on the cheeks. Start with brightly colored long johns or sweat suits. Cut “Crayon” and the leg and arm stripes out of felt. 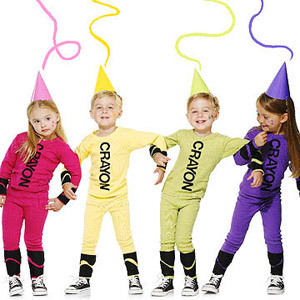 Spray glue them to the clothes and add a matching party hat for a great crayon costume. Save yourself about $20 compared to the store bought crayon costumes you used for inspiration. 16. 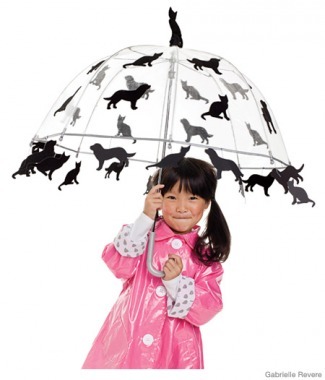 It’s Raining Cats And Dogs! Get some sticky felt or silhouette stickers of cats and dogs. Stick them to an umbrella, dress your child in a bright raincoat and galoshes, and they will have a blast! A shredded bit of sheet for the smock, combined with a tan colored skull cap hat like this one and felt ears makes Dobby come to life. Every age of kid loves jellybeans, so send them as a bag of the treats for Halloween. Get a clear trash bag, cut holes for the arms and legs, and print the nutritional facts about jellybeans on the back with a black Sharpie. 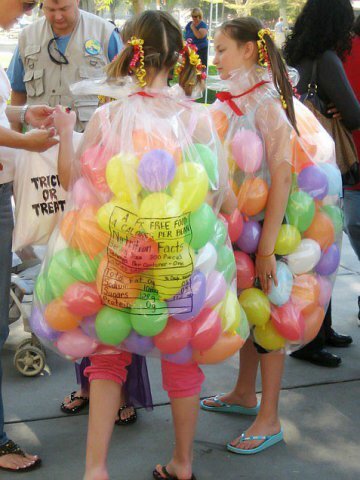 Fill the bag with colored balloons and tie the trash bag shut at the neck with a ribbon. Cut arm, leg and head holes in a box. 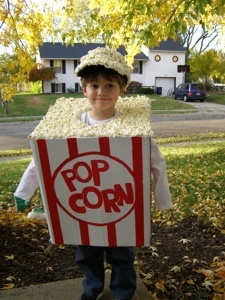 Paint the box like a movie popcorn package. Decorate the top and a baseball cap with popped popcorn hot glued on to the surface. 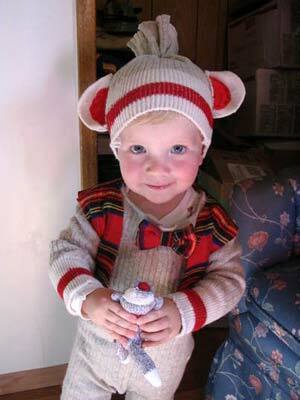 Dress your little one in cargo pants, a long sleeved white shirt and a sweater vest. Add Dollar store Harry Potter glasses like these and a crimson and gold muffler to complete the Harry Potter outfit. Use a brown eyeliner pencil to draw the mark on little Harry's forehead. You can look at this Harry Potter set from Amazon for inspiration on what the scarf should look like. 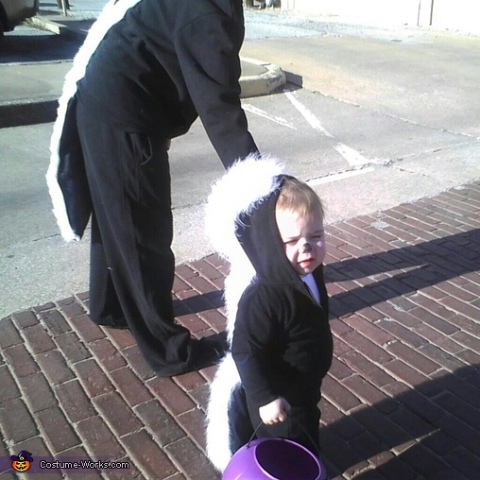 With these quick and easy Halloween costume ideas, your kids will be ready for trick-or-treating in no time! 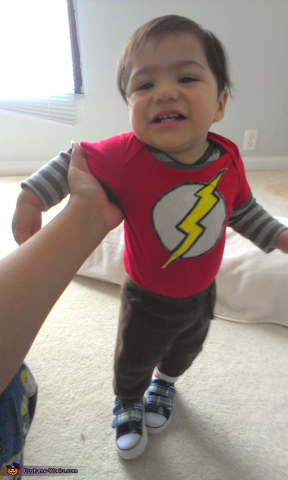 If you have an idea for a diy easy kid costume please share your ideas below. Thanks for the feedback. We have now removed most of the ads. Hopefully, it will work better now.